What is a Christmas Bird Count? What is a Christmas Bird Count (CBC)? A Christmas Bird Count is an organized event where groups and individuals attempt to census as many bird species in a designated area (count circle) in a 24 hour period as they can. A count circle has a designated center and the circle extends out 7.5 miles from that center, thereby giving you a 15 mile diameter circle. There is an individual in charge, usually called a compiler, who organizes the event. They will determine areas (subsets) of the count circle and send "parties" out to count in those areas. Most counts start around dawn and go to sunset. A few hardy individuals may go out early in the morning or after sunset to try to count owls as well. Technically the "count day" lasts from midnight to midnight. Birds seen in the three days prior to the count and up to three days after the count, but not on count day, can also be included in the report. These are referred to as count week species. During count day, parties will keep track of the hours they are birding as well as miles traveled. These are separated as hours and miles driving as well as hours and miles (or fractions thereof) walking. Parties try to count how many of each species are seen including subspecies such as yellow-shafted and red-shafted flickers, various junco subspecies, etc. 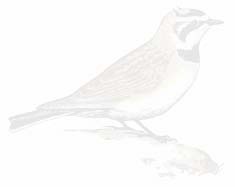 In cases where closely related species (say Eastern and Western Meadowlarks) can not be differentiated, they are grouped together simply as "Sturnella sp." or "Duck sp." for those distant specks in the middle of a large lake, etc. At the end of the day, the compiler will gather all the sheets, either informally, or formally at a compilation (for counts that have compilations they are fun social events!) The compiler will then total up all the parties results for the final results for that count. Normally these counts are conducted year after year with the count circle remaining stationary. This can result in long term data sets of great value. In Kansas we have some counts that have been running for over 60 years. An additional option for participation is to serve as a "feeder watcher". If the weather is extra cold or you simply can't, or don't want to, get out and about, you can spend several hours during the day keeping track of the birds that visit your feeders. You simply tally what species are present and the most you see at any one time. If you looked out once and there were 3 juncos, you looked out later and there were 4 juncos, and the last time you looked out there were 6 juncos, then you would record 6 Dark-eyed Juncos. Christmas Bird Counts were started in 1900 by ornithologist Frank M. Chapman as a non-lethal alternative to the traditional Christmas hunt. Nationwide, National Audubon Society (NAS) collects data on these counts and maintains a massive database. NAS has a good website about Christmas Bird counts. For a count to be an official NAS count it has to be conducted between December 14 and January 5. In Kansas, the Kansas Ornithological Society also collects this data and publishes the results in the KOS Bulletin's March issue each year. KOS allows counts to be conducted a few days earlier and a few days later. ABout 60% of the Kansas CBCs are included in the national database. In Kansas there are roughly 50 CBCs conducted every season. A listing is posted every year starting in mid November of where Christmas Bird Counts will be held, who is in charge, and how to get in touch with the compiler. If you go to the KOS Projects web page and click on the link that says "Kansas CBCs..." it will take you to the current year's listing. This is being updated throughout the month of November and even through the count season in case of reschedules or cancellations due to weather. In most cases, a birder can participate in a CBC by simply contacting the compiler and saying that they want to participate and then showing up at the designated place and time. Novices, and those who may not be familiar with the area will be teamed up with experienced counters. Some counts hit the area heavy in the morning and then sort of back off in the afternoon. Some only count until noon. Some count hard from before sunup to well after sunset. You need to visit with the compiler of the count to find out what is expected. In some counts you need to bring a sack lunch, in others the groups may meet up at a restaurant or a central location for a communal meal (again, great socialization!!!) Each count is a little different but all counts are fun and worth the time. You need to be prepared for potentially cold weather and bring your binoculars, spotting scopes, bird books and other birding gear. Bundle up, bring refreshments (but temper those liquid refreshments with available restroom resources!!!) and be prepared to watch birds, count birds and have fun.